Picking my own “Best Of” was too hard. So, I’m letting Google Analytics pick for me. 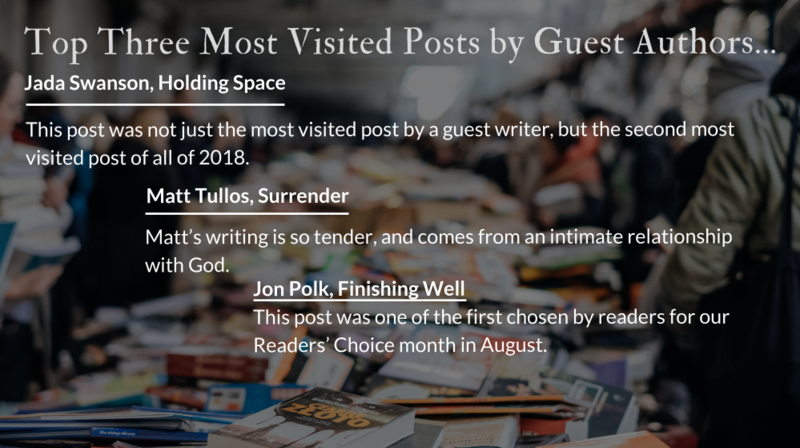 These are the top three most visited posts not written by a guest author in 2018. “We can be assured as we stand on Zacchaeus’s hope-filled Sycamore limb, that the King of Glory we hope for will not pass us by. The colt will carry our King. And in the end, all the broken who enter the courts of His temple, will be healed. 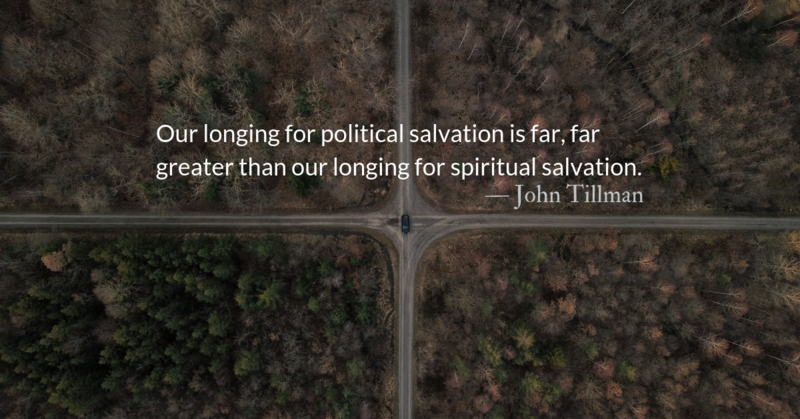 Politics is what people who have no faith in God must turn to for earthly salvation. Christians can and must do better. 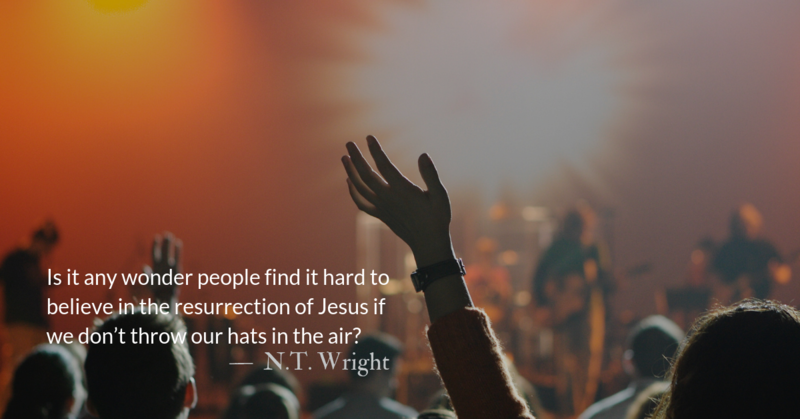 Since writing this post, several other pastors and writers have picked up the thread. May many more do so. May we abandon all our idols, but most importantly the idol of politics and politicians. After writing this post, a reader jokingly commented, “you take the fun out of everything.” She was right. Issuing a stinging rebuke can be fun and Jesus spoke his share of zingers. 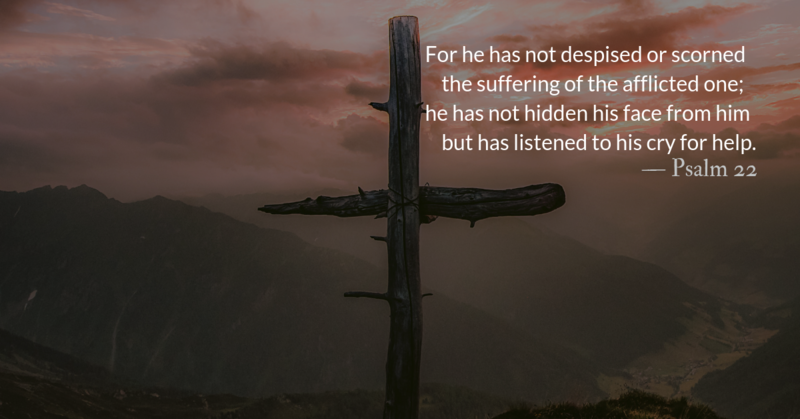 But so many times we excuse our sinful and petty hatreds by hiding behind Christ’s impassioned language that, we must remember, had a goal of calling people to him, not destroying them. Too often lately, Christians have participated in, or stood by allowing, hate-filled rhetoric. As Saul, who became Paul, can tell you, you don’t have to throw stones at someone to be guilty of their blood. You just have to hold the coats of those who do. As we move into 2019, we will continue to allow God’s Word to speak to us, to disturb our comfort, to disrupt our thinking mired in selfishness, and to spur us on to love and good deeds. Our culture values hard-hitting, biting words. The Internet swarms to support meanness. Crowds applaud words that degrade and attack. The Internet loves to verbally “stone” its victims, and too often Christians participate or give support to those who do, “holding the coats” of those who attack and degrade others. On January 1st we restarted our two year Bible reading plan in Genesis and the Gospel of Matthew. Join us on the journey. We read the Old Testament over two years and the New Testament and Psalms each year. Many publications and groups end the year with a look back. Two days ago we discussed how we recall our failures, and Jesus re-calls failures, like us, to himself. The remainder of this week we will look back at some highlights of the year, and look forward, relying on God to bring us the strength we need to continue in the coming year. The first place I’d like to look is our wonderful guest writers. Each of these writers has donated their work to our community this year and I, knowing how taxing it is to produce each 400 word chunk of our content each year, am immensely grateful to each of them. 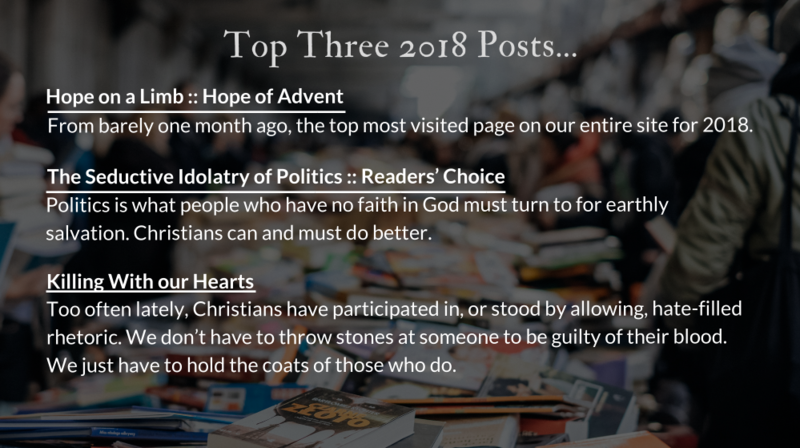 These are the top three most visited posts on our website in 2018, written by a guest writer. This post was not just the most visited post by a guest writer, but the second most visited post of all of 2018. Pray for Jada as she completes her doctoral work and we look forward to hearing her voice more often. As Christ-followers, we are called to carry one another’s burdens. However, when someone is navigating grief, a traumatic situation, or a horrific loss (relationship, job, etc. ), we must resist the need to try and fix the problem, heal the hurt, or repair the damage, and, instead, embrace the tension that exists. Although it can be awkward, during these sacred times, silence is our ally. Instead of expressing empty platitudes or well-meaning, but unhelpful Christianeze expressions, choosing to simply be present with another is the most loving alternative, even if the silence is deafening. What is most needed in these times is a willingness to simply “hold space” for another. Matt’s writing is so tender, and comes from an intimate relationship with God that is unafraid of tough questions and walking through the difficult times of life. The image of the cross is an image of absolute surrender. When we enter into the story of Christ we see a point in time when we cannot use our hands to control anything. 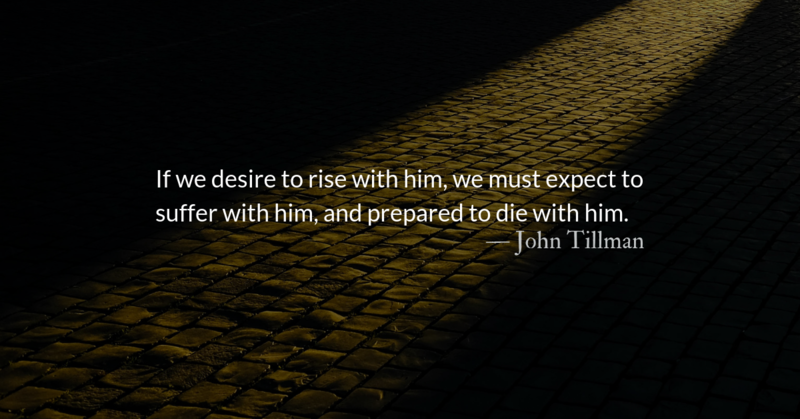 Our will, determination, ambition, and skill are nailed to the holy cross of Christ. While the world’s system teaches us how to control others and change ourselves, the cross has no such purpose. 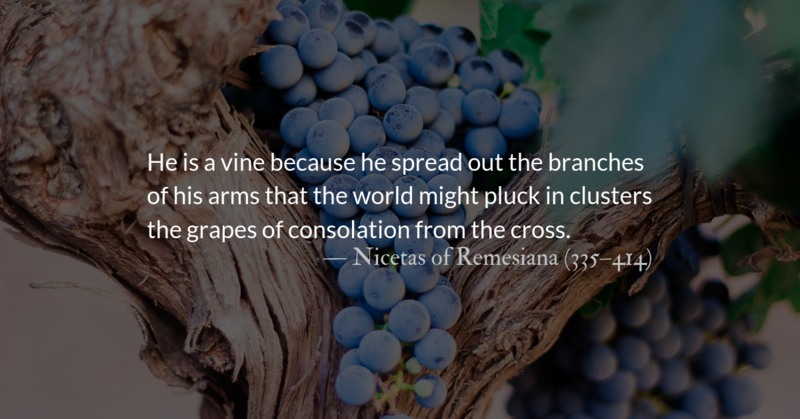 On the cross, our hands are not busy. They are surrendered. The next most visited guest post in 2018 was actually written and posted in November of 2017. Jon’s two week walk through the book of Hebrews was a highlight of 2017 that is still valuable to look back at today. This post was one of the first chosen by readers for our Readers’ Choice month in August. Athletic imagery is a common New Testament analogy for the Christian life. For a faith focused on the ideals of selflessness and sacrifice, it seems odd that biblical writers draw parallels with sports events focused on individual winners. A closer look at a few of these passages, however, reveals that there is more at stake in our spiritual life than winning. Dena Dyer also provided some wonderful devotionals that we were excited to share with you, and we look forward to more of her work, this week. As we look back, we anticipate the great work God will do in our lives and in the lives of our community through the new year. What is a word worth? What’s more, what is an encouraging word worth? The value of words for Christians is vastly different than others, for our Savior is known as The Word made flesh. 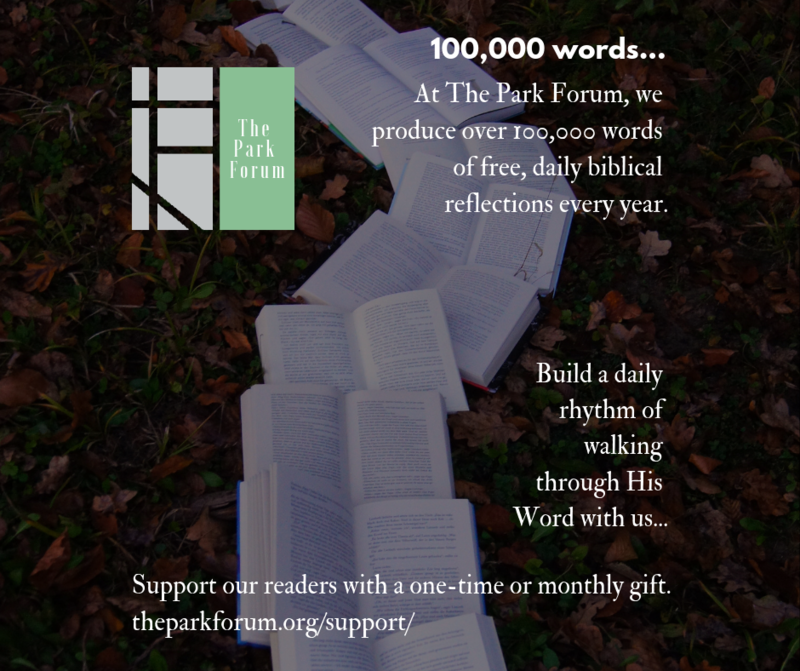 Our purpose at The Park Forum is to produce words that are filled with life. End of year giving is over, but one-time gifts and monthly donations are vitally important to maintaining our ministry. Join our monthly donors for 2019 or give a one time gift today.